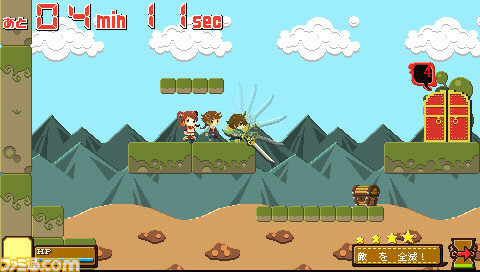 Although I've only played the demos of Half-Minute Hero that I downloaded from the PlayStation Store shortly after I purchased my PSP a few months ago, they were enough to assure me that I'd love the full experience. As such, I'm sure I'd love Jikan de Phantasia too. After all, it's being made by the same folks--at Opus Studio--responsible for Half-Minute Hero. Also, it's being billed as a "spiritual successor" to that MMV-published title. According to someone in the know (OK, it's just a NeoGAFfer), Jikan de Phantasia, which will hit the streets in Japan on July 8, is supposed to be the perfect RPG for the on-the-go gamer, as a full game session--including events, dungeons and boss battles--is generated based on the amount of time a player has to devote to it. For more information (and images), check out this NeoGAF thread or this Famitsu.com article. THAT'S SUCH A COOL IDEA! "Hmm...I have ten minutes before I have to get in the shower and go to work. Let's play!" And BAM! It is a great idea, isn't it? It's nice to know there are many creative folks in this industry, even after all these years. Betty White called; she wants her N64 back.